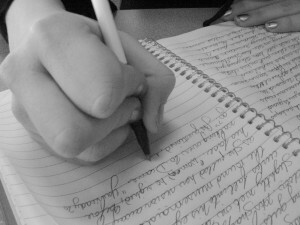 Emotional, or expressive, writing has long been proven to be a therapeutic tool that can significantly improve physical and psychological outcomes. Studies going back more than 30 years have show that writing about traumatic or stressful events is beneficial to healing so we were intrigued by the July 17th article in Salon, Study: Emotional writing heals physical wounds. The New Zealand study of seniors who wrote about the most traumatic or upsetting experience in their life, sharing their deepest thoughts and emotions that they had not previously shared with anyone, were found to heal physical wounds at least 45% faster than those who did not. This supports other studies with similar outcomes, including improving one’s immune system and sense of self worth. Writing is the act of discovery, of unlocking some kernel of knowledge or insight hidden in the shadow of our minds. This is especially true when we’ve been through a traumatic or emotional event that we may still be working through even though we thought we had put it to rest. Think of the men and women who have been to war or faced life threatening situations who write about their experiences as a way to come to terms with it. The therapeutic aspect of the act of writing is that it often brings forth those unsaid emotions and feelings that lurk inside and perhaps unknowingly hold us back. The discovery part of the process is the ah-ha moment of insight that can perhaps open the way to an even clearer resolution of the experience, thus releasing the under lying tension and stress. The mind-body duality is a powerful force which writing can help to balance. Journaling and diary keeping is certainly not new and has been the boon to many great novels and other important tomes through the ages. While not many of us will be noted writers—and we may even think we are not at all able to manage to write one coherent sentence after another—all of us have an eloquence that often startles those who do put pen to paper. The simple act of writing can open the mind to honest reflection and this self-analysis may lead to profound changes such as changing how we live our lives or healing faster from a physical wound. Regardless of our motivation for writing, it can be a freeing act for our souls to reflect on what it means to be alive. From such writing we learn how to absorb insights and how we are connected to each other; thus it becomes an itinerary of our uniqueness in an often-cloudy world. What do you have to write about? How can writing help you?